As you look at the above seal, the name “Rephaihu…Shalem” is written in Palaeo-Hebrew. This script goes back to the days of Moses. 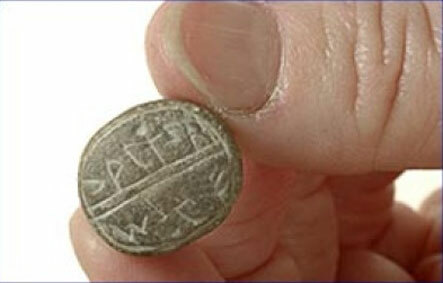 Yesterday, Israel Ministry of Foreign Affairs posted a brief article about the finding of seals, which included the one above, in the City of David that dated to the 8th century. “Finds recovered from the excavations in the City of David reveal an interesting development in the ancient world: whereas during the 9th century BCE letters and goods were dispatched on behalf of their senders without names, by the 8th century BCE the clerks and merchants had already begun to add their names to the seals.” Check out 8th Century BCE seals found at City of David excavations 27-Feb-2008 (HT: Jim Davila). If you have been following the global warming Debate, I have previously reflected my skepticism of the extreme positions of radical environmentalists (for my posts, click here, here, here, here, here and here). In keeping with my cynicism on this subject, I read with great interest "In Alaska, It’s Polar Bears vs. Oil Wells": "ANCHORAGE, Alaska – The polar bear can be found in just one place in United States — Alaska — and is perhaps as much a symbol of the state as alligators are of Florida. So you might think Alaska’s politicians would be pounding on doors in Washington to protect it." In contrast to what one might think, the Alaskan politicians are correctly not concerned about placing the polar bear on the endangered species list. As the article continues Governor Sarah Palin and Alaska’s Republican congressional delegation are opposed to the United States government placing Alaskan polar bears on the Endangered Species List because, for at least one reason, they "reject climate models that predict a complete summer meltdown of the polar ice cap by 2030 or sooner. 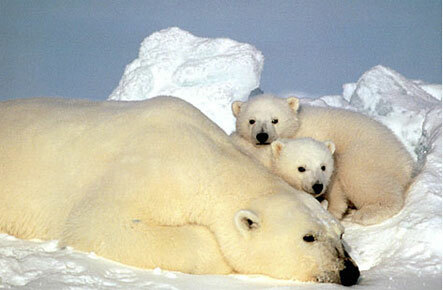 They also dispute a U.S. Geological Survey study that predicts polar bears in Alaska could be wiped out by 2050." As I have previously pointed out there is good scientific reason to reject this global warming hypothesis ("Sun, Not Man, Main Cause of Climate Change, New Study Says" and "A 2000-Year Global Temperature Reconstruction Based on Non-Treering Proxies"). Alaska’s elected politicians are not only opposed to placing polar bears on the Endangered Species List but are also supportive of opening the Arctic National Wildlife Refuge to drill for oil. Unfortunately for Alaska, both issues are still before Congress with strong opposition coming from politicians in the continental United States and environmentalists. If you are a Christian, you should not get caught up in the excesses of radical environmentalism. Global warming will not destroy the world. However, God in his own timing will intervene into the space and time continuum to destroy both heavens and earth with fire, as 2 Peter 3:7 states: "By the same word the present heavens and earth are reserved for fire, being kept for the day of judgment and destruction of ungodly men." However, this should not be a fear for the godly because they will not be part of this judgment. Further, believers have a divine promise that God gave to Noah in Genesis 8:22: "As long as the earth endures, seedtime and harvest, cold and heat, summer and winter, day and night will never cease." As long as God lets me live on earth, I expect life to continue just as he promised Noah. Thank God for his promises. God has everything under control. 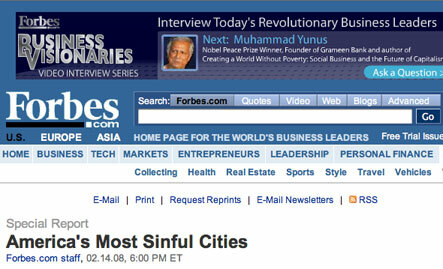 Guess What City Ranks among America’s Most Sinful Cities? The recent focus of many people living in the Detroit area has been on the Detroit mayor’s text message scandal (for more information about his struggles, click here and here). The current scandal has its roots in the Whistleblower Trial of 2003. Ewalt’s description of Detroit is distressing. It is bad news for Detroit to have the ignominy of being labeled as “America’s Most Murderous City.” The current text message scandal only adds to Detroit’s ongoing dubious distinction among cities in the United States. However, the Detroit area has some positive distinctions, such as the Detroit Symphony Orchestra and The Henry Ford,” to name a few. In my estimation, what is more important for any godly influence in the Detroit area are those churches committed to a clear proclamation of the Gospel message that demands sinners to repent and believe in the Lord Jesus Christ. There are a a number of historic fundamentalist and conservative evangelical churches in the Detroit area. Though there are a number of good churches, let me name two larger fundamentalist churches that I am very familiar with and can positively promote: Inter-City Baptist Church and First Baptist of Troy. Though life in the Detroit area has significant problems, my prayer is that not only Inter-City Baptist and First Baptist of Troy but all the churches committed to a gospel proclamation of Christ’s lordship will serve as salt in an area that desperately needs this message coupled with the regenerating work of the Spirit. Is Great Britain Close to Permitting Sharia Law? How far will Great Britain go in allowing Muslims to change Britain’s law? As Al Mohler notes: “For the past two or three decades, Britain has been engaged in a radical experiment in abandoning its own national identity. It has encouraged a huge number of Islamic immigrants to enter the country. This explains why some of the most extreme sects of Islam have taken root on British soil. Just a few weeks ago, another senior cleric warned that some areas of Britain’s cities has become ‘no go’ zones for non-Muslims. Any casual visitor to some British cities will know exactly what he means.” Do not miss reading Al Mohler’s “Sharia Law in Great Britain?” Does this have implications for the United States? 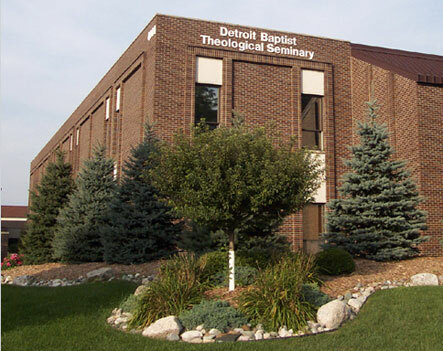 We began our Spring Semester on January 21 at Detroit Baptist Theological Seminary. Before the semester advances too far, I wanted to post a few pictures from my classes. At this point in the semester, the students generally look wide awake, though this will quickly change. 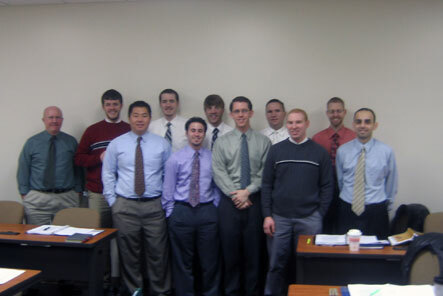 The first group picture is of my Old Testament Poetic Books’ class. As the group was preparing to take a short recess, I took a picture of them in the back of our classroom. At this point, they may be thinking what have I gotten myself into. 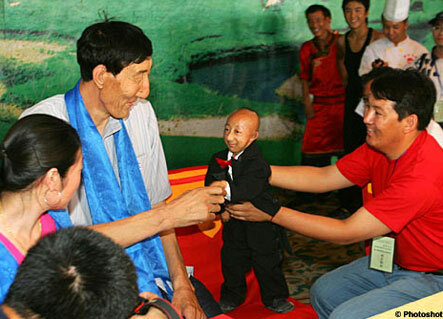 The above picture of the tallest man meeting the smallest is taken from Living in the Whine Country. Can skeletal and behavioral evidence be used to prove that the Hobbit, Homo floresiensis, is not fully human? In Reasons to Believe’s volume 9, number 4 2007 edition of Connections, Dr. Fazale Rana of Reasons to Believe uses this type of evidence to argue that the Hobbit was not fully human. In this open letter, recent creationist writer Ryan Jaroncyk challenges Dr. Rana’s argument. Ryan Jaroncyk’s letter is a respectful and well-documented response. To read this response, go to An open letter to old-earth creationist, Dr. Fuz Rana.